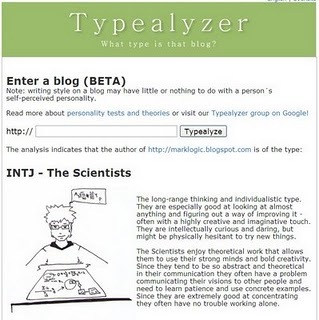 A colleague just pointed me to this site, Typeanalyzer, which claims it can identify the Meyers-Briggs Type Indicator (MBTI) of a blog’s author by examining his or her blog. It’s not that Dennis (ESTJ) doesn’t trust me. He’s just an S and thus he needs more data than I do to justify a decision. And sometimes, his S will save me because once in a while his data will trump my intuition. It’s not that Andrew (ENTP) is a bad person. He’s just a P, and thus I can be certain that he will never finish anything unless I put a gun to his head. And, while that can be irritating, it’s manageable and I definitely appreciate the creativity and broken-field running that come along with his P.
Typeanalyzer’s verdict for the Mark Logic CEO Blog was dead right: INTJ. You might take a look at my post on the subject a few months ago: Blog Analysis Tools: Not Quite Ready for Prime Time. That’s interesting–I got an INTJ for our Thinking Out Loud blog too–close as I am an INTP. I’m a big fan of MB as well–it can be misused, but if used judicially and in the right spirit it is really useful. Not convinced! Whatever I point it to on my site (i.e. month archives) it always turns up INTJ (I’m ENTP/J), and when I just pointed it at another blog I’m working on, I get ESTJ… Random number generator on URL? OK, maybe it just got lucky with my blog! In reality, I suspect a big part of what’s going on is whether the blog is business or personal in nature. I pointed it at a very analytical INTJ-y friends blog who showed up some loving type (e.g., ENFP) … all becaus the purpose of the blog was to share things about the kids and family with loved-ones out of the area. Daniel — I liked your post. While I posted the blog type analyze mostly for fun, I do actually like MBTI as a executive team building tool simply because it helps people embrace differences. But I agree, as per your post, that it’s probably not real science / unscientific.